Add some instability to your audio. If you like your effects to of the predictable, common or garden variety then unstable - a free pitch modulation plugin from De La Mancha - probably isn't your thing. However, if you're happy to accept unpredictable results and like the idea of emualting the pitch instability of an old tape machine or analogue synth, give it a whirl. You don't need to be too fearful of unstable, because it can be a fairly subtle processor, but there is an insane mode, too, if you want to take things off the scale. There are three modes of random pitch modulation - buzz, wobble and drift - and you can adjust the frequency and level for each of these. 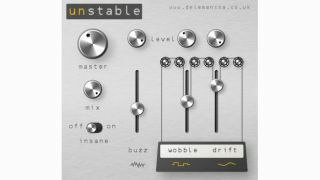 You can download unstable for free now from the De La Mancha website (it's a Windows VST plugin). It was previously payware, but the developer is now suggesting that, if you like and use it, you could make a donation to Cancer Research UK.